Seven individuals and hospital trusts have been recognised for their outstanding work at Bayer’s Ophthalmology Honours awards evening held on 1 December 2016. The awards evening, hosted by Bayer and supported by RNIB and Visionary, recognises and celebrates multi-disciplinary teams throughout the UK who have developed exceptional initiatives that demonstrate clinical excellence and innovation in the area of ophthalmology. Judging panel member, Augusto Azuara-Blanco, Professor of Ophthalmology at Queen’s University Belfast, said: “This was another great year for the Ophthalmology Honours. Not only did we see the same level of high quality entries as last year, we also saw an increase in the number of winners as we, as judging panel, had such a difficult job deliberating and selecting the final results. 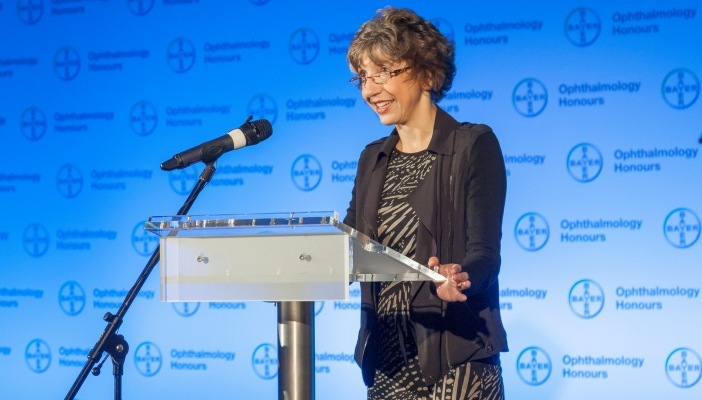 Dr Jackie Napier, Medical Director, Ophthalmology & Neurology at Bayer, said: “Our commitment to the ophthalmic community and to improving outcomes for patients is demonstrated via our ongoing support for initiatives such as the Ophthalmology Honours. Not only does this programme support the sharing of best practice at a clinical level, it also recognises excellent patient care and support provided by the entire multi-disciplinary team. The development of the awards programme was guided by a steering committee of experts including consultant ophthalmologists, specialist nurses and a representative from the RNIB. The large number of entries were judged by ten experts in ophthalmology care, with the decision-making process being wholly independent from Bayer. The photo shows Jackie Napier opening the ceremony. Find out more about the results, categories and entry process for Ophthalmology Honours.